Alipay Wallet, the mobile app operated by Alibaba’s finance arm, announced today it has 190 million annual active (at least one payment or money transfer in a year) users. The number of daily transactions through mobile has reached 45 million, with over 50% of the total from Alipay (with Alipay supporting third-party businesses as well as Alibaba’s own marketplaces such as Taobao and Tmall). A little less than one year ago Alipay Wallet had 100 million users and was processing one third of Alipay’s transactions. By of the end of 2013, Alipay had a total of 300 million users. At the end of 2012 2013, the Alipay mobile version was rebranded Alipay Wallet, an app not just for mobile payments but also for financial management and daily transactions. From then the app has added functions and features such as e-loyalty programs, e-ticketing, scanning-to-compare prices, credit card management, bookkeeping, real-time information on stocks, amongst others. It also has been expanding the payment service from online physical or virtual goods sales to the offline world and service sector. Alipay Wallet now supports payments for taxis and public transportation, and is available at vending machines, convenience stores, department stores, pharmacies, hospitals, and parking lots. When it comes to technologies, Alipay Wallet can process payments through QR Code, voice, and fingerprint, and the company is working on other methods. Alipay Wallet has become a competitor to Tencent’s WeChat in mobile commerce and mobile content. One year ago Alipay Wallet added a layer for third-party businesses, which is similar to WeChat’s public account platform. Services like DDMap, an e-coupon service Alibaba has a stake in, and iReader, a mobile reading service, have been available on Alipay Wallet. More than 60 APIs were released one month ago that enable third-party developers to create more applications on top of Alipay Wallet. Xinxiwang Shuangfeng, a provider of dairy products, has integrated into Alipay Wallet and is now selling bottled milk on it. 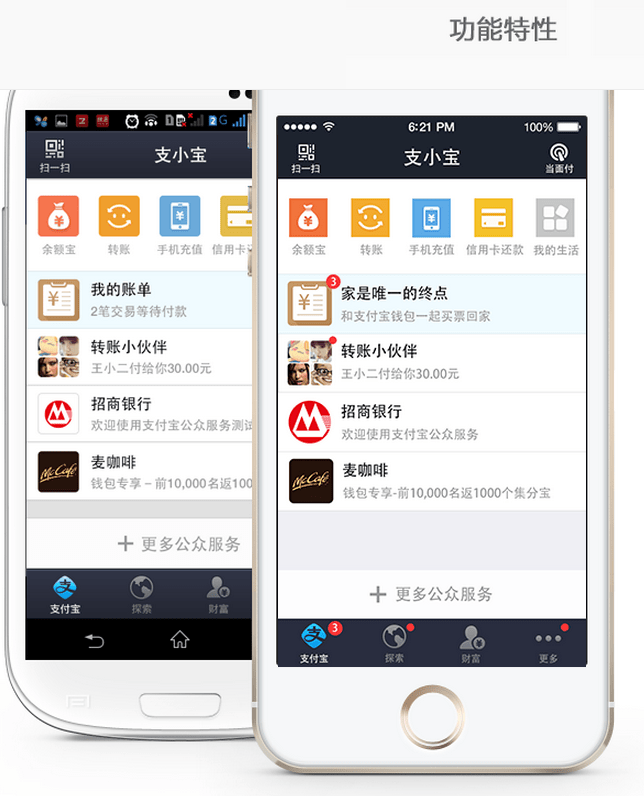 Alipay Wallet began expanding to markets outside mainland China from early this year.